It's the 4th of July week, HOORAY! It's only appropriate to celebrate America by BBQing and spending quality time with family and friends. This recipe is one of my favorites from a very good friend of mine, Christine. At first glance you think it's your everyday potato salad, although after just a bite the tangy flavor and crunch of the Granny Smith apples combined with the potent zing of the blue cheese create a perfect surprise. For each and every holiday I'd request that she make this, her specialty, and she would always oblige. She no longer lives in Hawaii and when she left she passed her ever famous recipe on to me. I'd return the recipe to have her back here in a heartbeat, although I'm honoring her by recreating her infamous BBQ side dish. The red potatoes are the backbone of this dish so I like to be sure that they're the largest in size. The big surprise is the Granny Smith apple. When you get that cool, crunchy, refreshing bite it's obvious that this potato salad is like no other. Although this recipe includes red potatoes and blue cheese appropriate for the patriotic occasion, most of the ingredients are green! The varying sizes and flavors really add to the pizzaz of this unconventional tater salad. Christine's original recipe called for mayonnaise and sour cream, although I tweaked it a bit to include Greek yogurt and lighten it up, just a bit. This colorful potato salad is cool, crunchy, tangy, and addicting. This was prepared on June 30 and doesn't stand a chance in making it until the 4th of July! Cut red potatoes into (large) bite sized pieces, leaving the skin on. Boil them for 10 - 15 minutes or until tender. Drain, then chill potatoes in the fridge. In the meantime, cut the apples into (medium to small) bite sized pieces. Chop your green and white onions and celery. In a large bowl, combine the apples, both onions, and celery then add the Greek yogurt, mayo, sour cream, and blue cheese and stir to coat. Finally, mix the potatoes with the delicious mixture of unconventional potato salad fixin's, cover and chill. If possible, chill overnight! I have a confession, as I wasn't completely honest with you right out of the gate. On the anniversary of Lady Liberty's birth, I'll neither be BBQing nor spending time with friends, but chasing the American Dream! That's just a really fun way of saying that I'll be at work. Certainly my office, aka the Battleship Missouri, is in high demand on such a patriotic day. As my wedding is quickly approaching, Barbara [of Barbara Cooks] just got married and will be honeymooning in Hawaii next month. Jillian [of Food, Folks, and Fun] is married to a Marine and expecting their second child, and Rebekah [of Decadently Fit] is a seasoned Mama of 2. It was truly inspiring to be around ladies who, in addition to being food lovers and diligent bloggers, are all just a steps away on the staircase of life's milestones. This is our way of teaming up, a virtual pot-luck of sorts! It was so nice to get to know other food bloggers and put faces to the 'about me' sections in real life. Here's what the other ladies brought to our July 4th BBQ, although this time just in spirit! Rebekah, always the health minded cook, also brought a side dish/salad. 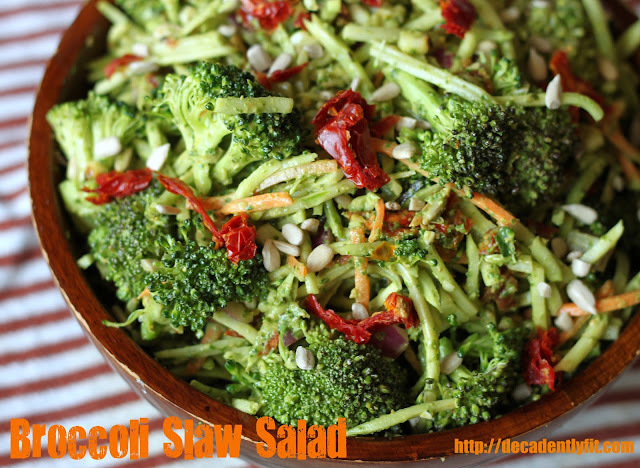 Her broccoli slaw salad flips the once fattening, bland side dish on its side with a nutritiously decadent makeover. This easy and guiltless recipe is a must for your next BBQ. Barbara completely blows my mind with her exciting flavor combinations and today is no exception. 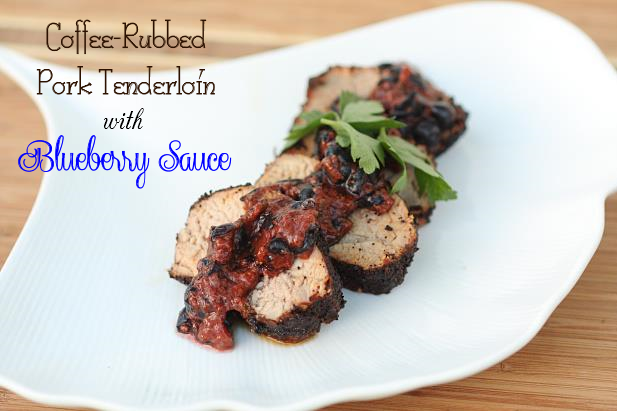 She brought the main dish - a coffee-rubbed pork tenderloin with blueberry sauce. Yes, barbecued coffee served with a sweet and savory blueberry sauce. Coffee and blueberries aren't just for breakfast anymore! Finally, Jillian has whipped up something sweet and adorable, as usual! Her goodies look too pretty to eat, which is OK when you don't actually have the chance to taste them ;) Her dessert of choice is a creme brulee tart. 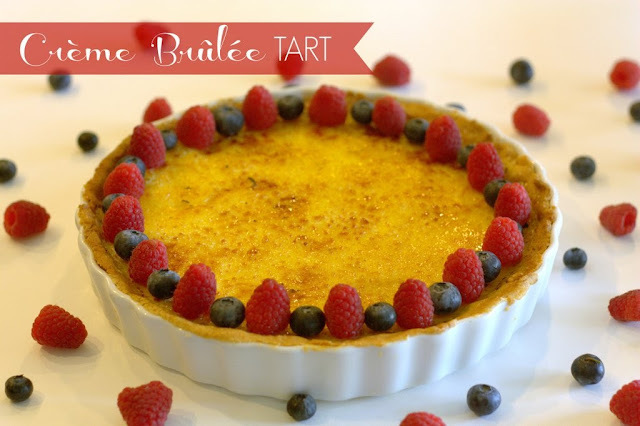 She takes on the French classic with smooth custard, a flaky tart shell, crackling burnt sugar topping, and fresh berries. Old friends, new friends, and plenty of great memories connected with delicious foods. That's what I call the 'pursuit of happiness!' Happy July 4th.